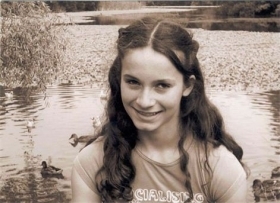 On the 25th March 2010 – just 9 days before what would have been her 16th birthday - Eilidh Brown passed away after a 14 month battle with Germ Cell Cancer. The Eilidh Brown Memorial Fund has been set up by her family to make Eilidh's wish to help others in her situation come true.The aim of the Memorial Fund is to build and maintain a respite holiday home in the Stirling area for young people and their families who are in treatment for, or recovering from, cancer. A place where, not only the families can relax and spend quality time together, but can make memories that will last a lifetime. Eilidh’s parents, Gordon and Nicole, are former actors on the Stirling GhostWalk, and Eilidh’s cause is very dear to the hearts of all of us involved with the show. Planning application for Eilidh’s Respite Holiday Home has been granted, local architect Bobby Halliday has designed the cottage, and many local people and businesses have pledged their time, money and labour to make Eilidh’s dream happen. Over £200,000 has been raised so far, but more – much more - is needed. Even when completed, the cottage will cost around £30,000 a year to maintain. Each January the MacRobert Arts Centre, Stirling hosts a fundraising concert to raise money for the Eilidh Brown Memorial Fund. Local muisicians, dancers and comedians are joined by the likes of The Fratellis, ‘Lord of the Rings’ actor Billy Boyd, ‘River City’ star Tom Urie and many others. This is the one Friday night in the year that you can be sure there will NOT be a GhostWalk...as the spooks will be at the MacBob enjoying the show, and encouraging others to honour Eilidh’s legacy. Author’s-Royalties from Happy Hangman David Kinnaird’s books, ‘Haunted Stirling’ and ‘Auld Stirling Punishments’ also go to help this worthy cause. A drop in the ocean...but every little helps!